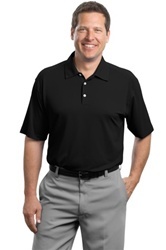 Work (or play) your best in this lightweight sport shirt built with Dri-FIT moisture management technology. An intricate chain-link texture gives subtle character while panels on the shoulders and under the arms add more visual interest. With double-needle stitching throughout, the design features a self-fabric collar, three-button placket, embossed Swoosh design trademark buttons, open hem sleeves and side vents. Pearlized buttons are selected to complement the shirt color. The contrast Swoosh design trademark is embroidered on the left sleeve. Made of 4.1-ounce, 100% polyester.